Bees:The most common stinging bee in California is the honey bee. It was introduced into this country from Europe in the 17th century. Its stinger, which resembles a hypodermic needle with barbs, is used to inject a mixture of alkali venom and acid into the skin. The alkali venom contains several kinds of proteins and enzymes which are believed to cause allergic reactions of varying degrees in humans. We provide bee control services such as bee extermination and bee hive removal. Leaving the Honey comb will result in future and immediate problems. Rats:The fact about rats is that they are everywhere and not easy to control, unless you are a professional. Specifications for rats can vary. The length of an average rat is from 6-18 inches that's including their tail. Roof rats tend to be charcoal gray in color as compared to your sewer rat which is a brownish tan. Their diet consists of eating almost everything, its not much of a diet. They consume ½ to 2oz of liquid a day. These are nocturnal creatures they eat and drink under the cover of darkness. They are loud and gnaw at anything they can, rats have been known to cause electrical fires in homes by exposed electrical wires in attics. Rats are the cause of much damage and carriers of parasites and diseases. Pigeons mate for life and rear their broods together, although if one dies the other will take a new mate. Once the simple nest is built, the female lays an egg and then another a day or so later. The incubation period for common pigeons is 17 to 19 days. The female sits on the egg from late afternoon through the night until about 10AM. The male then takes over and does the day shift. Once the eggs hatch, both parents feed the young squabs. The first food is pigeon milk or crop milk, a cheesy substance that appears in the crops of the parents at hatching time and is fed for a week or so. Then the adults start regurgitating partially digested grains for the young. By the time the squabs are ready to fly, about 4 weeks, the father is doing most of the feeding. The squabs are fed for another week to 10 days after they are free-flying. Bats, while some species can be larger, bats are usually not much bigger than a house mouse. The wingspan of the two most common Canadian species, the little brown bat and the big brown bat, ranges from 8 to 14 inches. Bats will mate in fall or winter and the pups are usually weaned in July or August. A few bat species will migrate to the south when cold weather approaches while other species will just move to caves, mines, and attics where the temperature does not go below the freezing point. In some cases, the big brown bat will even roost in buildings throughout the winter if conditions are favorable, e.g. high humidity level and temperature above the freezing point. Bats are loyal to their birthplaces, often returning to the same roost site year after year. A bat can live more than 10 years. The cliff swallow is 5 to 6 inches in length and is the only square-tailed swallow in California. In contrast, its long, deeply forked tail distinguishes the barn swallow. The cliff swallow is also recognized by its pale, orange-brown rump, white forehead, dark rust-colored throat, and steel blue crown and back. We are an environmentally caring company and do not harm any animals with our animal control methods. We trap raccoons, opossums, Pigeons, and skunks. After the animal is humanely trapped, we release the animals into the wild away from nearby towns or cities to deter them from returning. Animals dying and decomposing is the natural part of the life cycle, but for it to happen behind your walls or under your house is a nuisance. 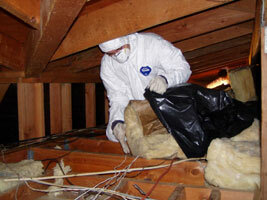 Our Technicians are well trained in locating and removing the dead animal. For dead animals in public please call your local animal control center. These are among the larger (6-12 mm) ants in the United States. Most are black but some are various shades of brown or red and black. They usually have an evenly rounded thorax when viewed from the side with a circle of tiny hairs on the tip of their abdomen. There is only a single node in the thin-waisted petiole region. Carpenter ants are social insects that usually nest in the center of rotting trees or water damaged areas within wooden structures. These ants feed on many foods. They do not feed on wood. The colonies are sometimes located by sawdust-like debris dropped near their excavation. At 900 F, their life cycle is completed in about 2 months Eggs hatch in 24 days with the larval and pupal stages lasting 21 days. This is the most common species of cockroach in the United States. It is about 1/2" to 5/8" long as an adult. Nymphs and adults of both sexes have two dark stripes behind the head. It prefers to live in kitchens and bathrooms of homes and apartments, restaurants, supermarkets, and hospitals. The Asian cockroach, Blattella asahinai, is identical to the German cockroach in appearance and lives outdoors in lawns and leaf litter. This cockroach is about 1 1/2" long as an adult. It is reddish-brown with light markings behind the head. The cerci at the tip of the abdomen are long and thin. It is commonly found in sewers and basements. This cockroach is almost identical to the American cockroach in appearance and is about 1 1/4" long as an adult. It is reddish-brown. The cerci at the tip of the abdomen are stubby; whereas the American cockroach has long, thin cerci. The brown cockroach is found outdoors. It readily enters houses and is often called a palmetto bug. It is about 1" long as an adult. It is shiny black and has no distinctive markings. The male has wings that cover only about 3/4 of the abdomen; the female has only wing pads or lobes. This cockroach is not commonly found in Florida. It is usually found in damp basements, sewers, and crawl spaces beneath houses. Adult fleas are flattened from side to side, dark colored, wingless and have strongly developed legs. Their hind pair of legs are especially adapted for jumping. They have sucking mouthparts used to siphon out the blood of animals. Larvae are worm-like, legless and tan. They feed on organic debris, dried blood and excrement from adult fleas. Fleas usually bite humans where clothing fits tightly against the body. Adult fleas can live for several weeks without a blood meal. When found indoors, they are usually associated with pet dogs or cats. Fleas can transmit several diseases including bubonic plague and tularemia. They are also the carriers of a tapeworm which, in the adult stage, is found in dogs and men. These links will help you get ready. Female is one-half inch long; shiny black, with hourglass-shaped red mark on underside of abdomen. Can be found almost anywhere, indoors or out; prefer to build their nests close to the ground. They eat insects trapped in webs made by females. Contrary to popular belief, female is usually unsuccessful in any attempt to eat the male after mating; 300 to 400 eggs are laid in silken cocoon, hatch in about 10 days. Black widows are not aggressive, and will not bite unless provoked. However, they are poisonous. If bitten, seek medical attention; bites are rarely fatal. Not more than three-fourths-inch long; thorax composed of seven hard overlapping plates with seven pairs of legs; only pillbugs are able to roll up into a ball. Pillbugs prefer moist locations; found under objects on damp ground; mostly nocturnal; often invade basements and first floors of houses. They feed on decaying vegetable matter. Female gives birth to between 24 and 28 young per brood; usually one to three generations a year; may live as long as two years. Pillbugs and related sowbugs are the only crustaceans that have become completely adapted to living their whole life on land. Our decontamination services includes Residential, commercial, and Industrial areas.